Nestled between the Kern River and the golden foothills of the county of Kern, the Kern County Soccer Park was established in the late 1970’s by volunteers. The land was originally acquired from the Kern County Parks Department and over the decades usage fees have been reinvested to properly maintain and improve the facility. The park is currently managed by the Kern County Soccer Foundation. The park is comprised of 86 acres with parking for over 5,000 vehicles, and is home to 20 regulation-sized soccer fields, 4 snack bars, 8 built-in restrooms and RV Parking. We have implemented lighted fields and a comfortable headquarters building, with a PA system that allows us to host many different types of events and tournaments throughout the year. 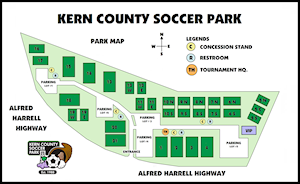 The Kern County Soccer Park is home to AYSO Region 181, Cal South, ACES, CSL, CCSL, BRYSL, and Premier Soccer League. Additionally, The Bakersfield Soccer League uses the facility year round. The Kern County Soccer Park hosts Numerous tournaments and outdoor activities throughout the year. The Kern County Soccer Park remains the premier youth soccer facility on the west coast. With the support of the soccer community, the County of Kern, and the City of Bakersfield, the Kern County Soccer Park will continue to provide a fun and safe facility that promotes youth soccer and remains an ambassador of good will to those who visit..